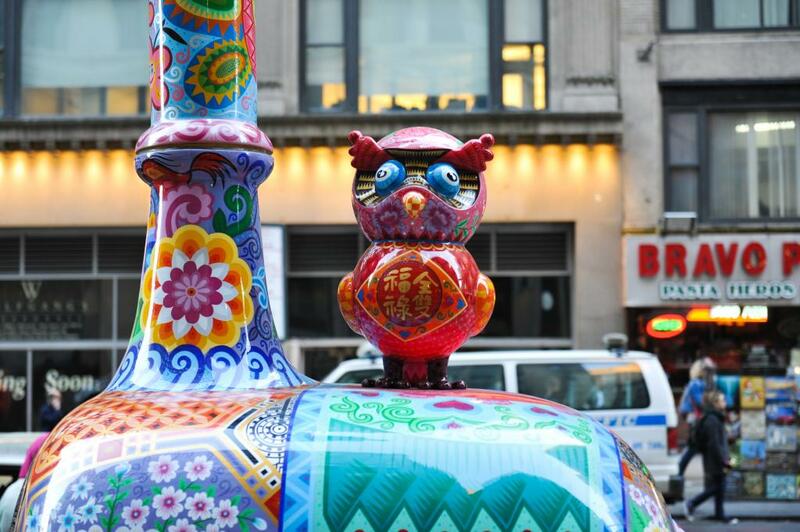 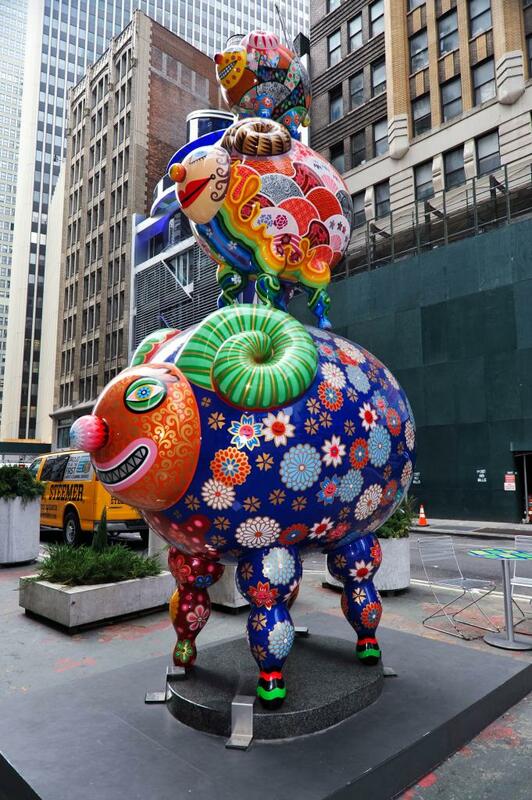 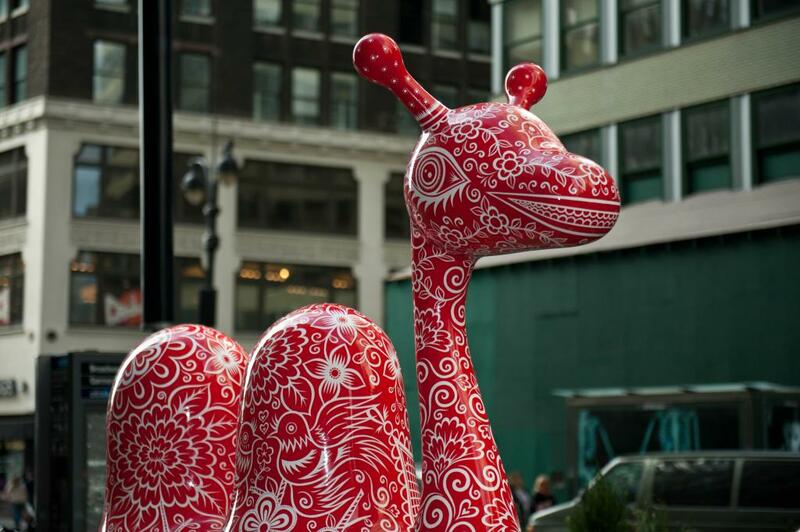 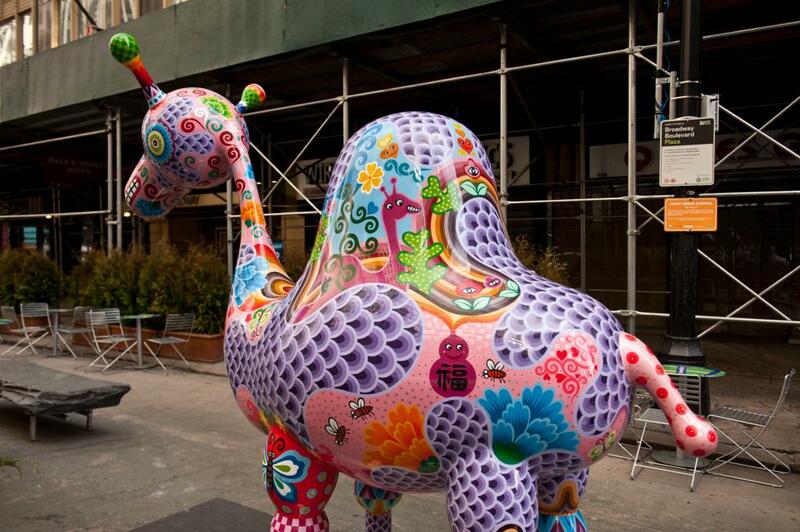 Since last fall, a stretch of the pedestrian plaza along Broadway in the Garment District has been home to a menagerie of fantastic creatures conjured by Taiwanese artist Hung Yi (洪易). 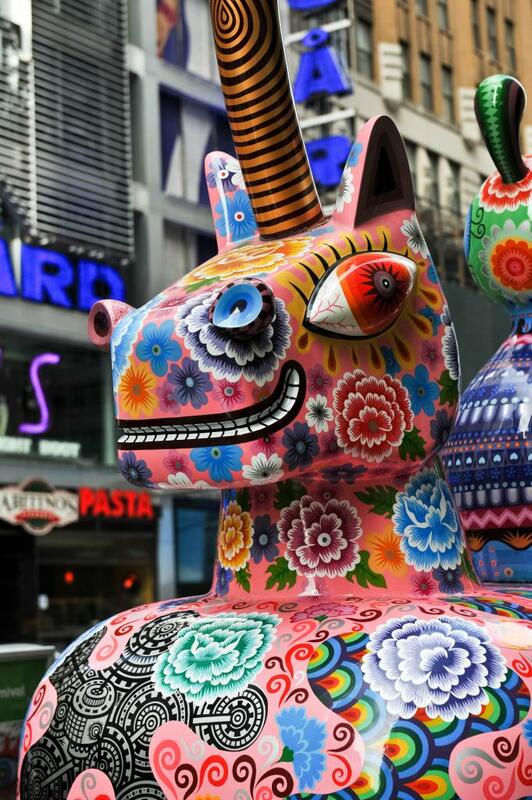 Fancy Animal Carnival features roughly a dozen of the restaurateur-turned-artist’s signature whimsical animal sculptures which have brightened public spaces around the world. 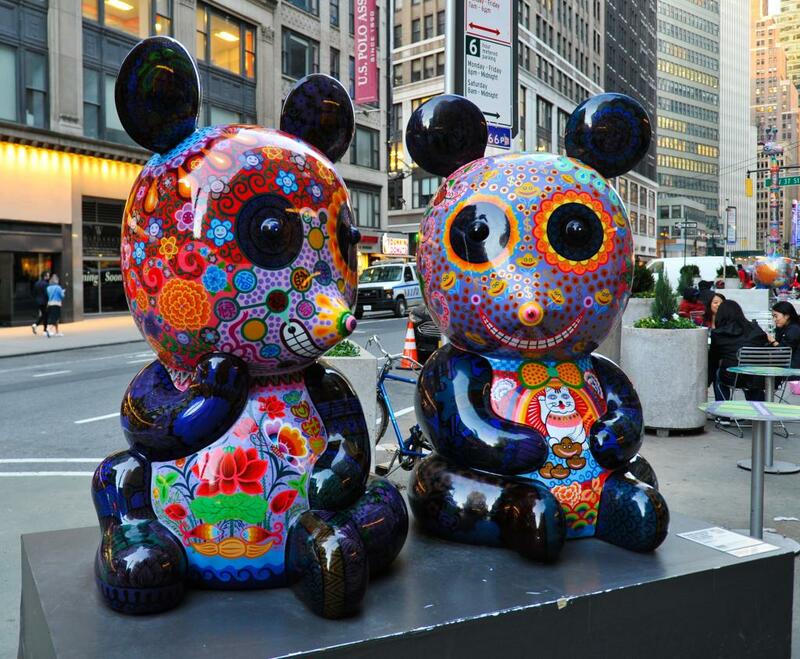 The sculptures, cartoonish in form and made of baked enamel on steel plate, are big and friendly. 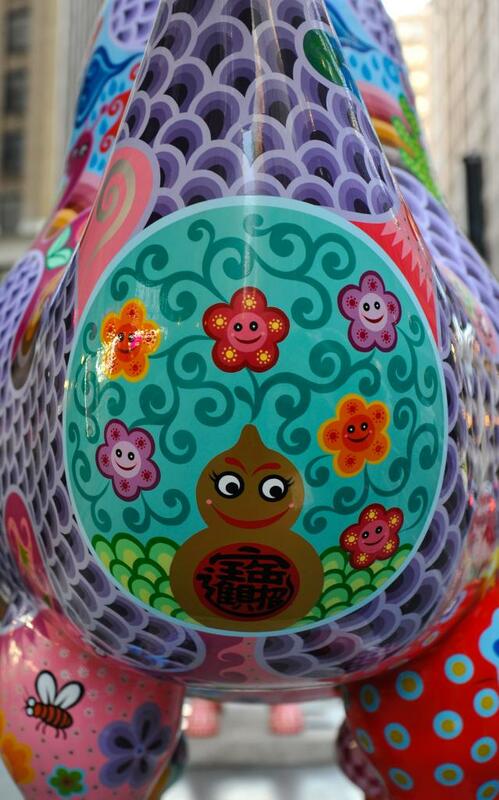 Passersby, children especially, are drawn by their vibrant colors and potpourri of symbols and patterns influenced by Taiwanese floral textiles (also known as Hakka floral fabrics), Chinese characters, symbols, and folk art, and Japanese pop-art. 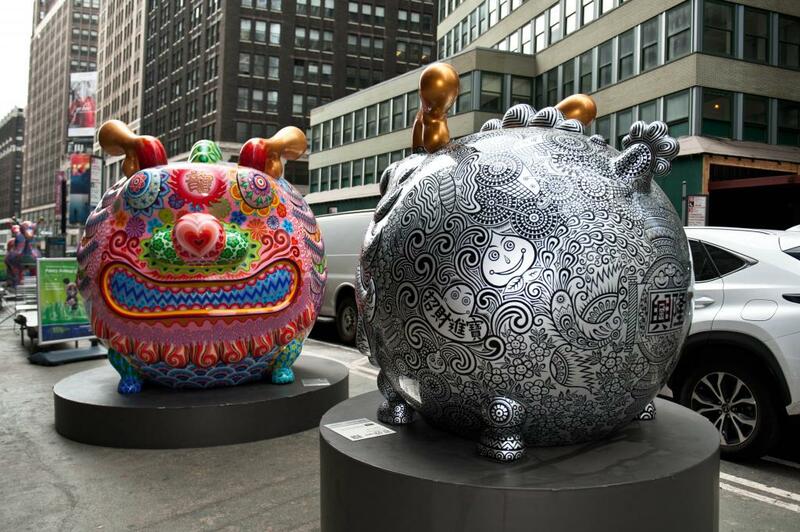 The animals grin widely and seem over-caffeinated as they flaunt their busy dreamcoats. 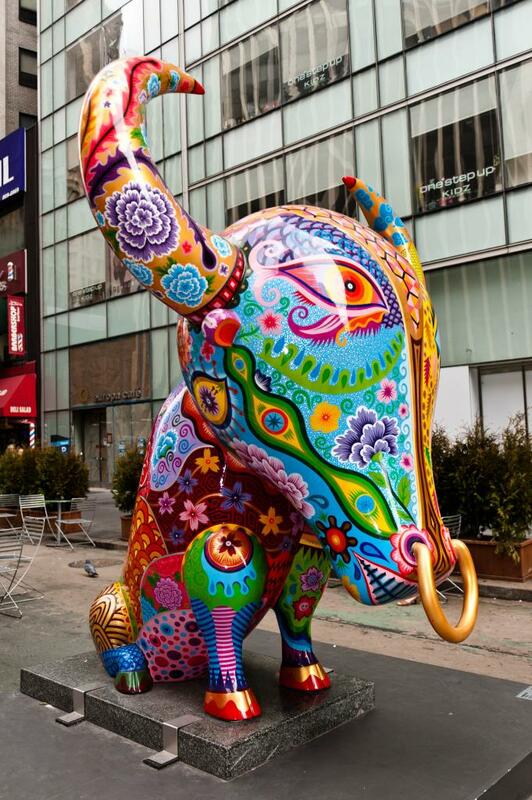 While all of them are a pleasure to see and pose with, a few stand out. 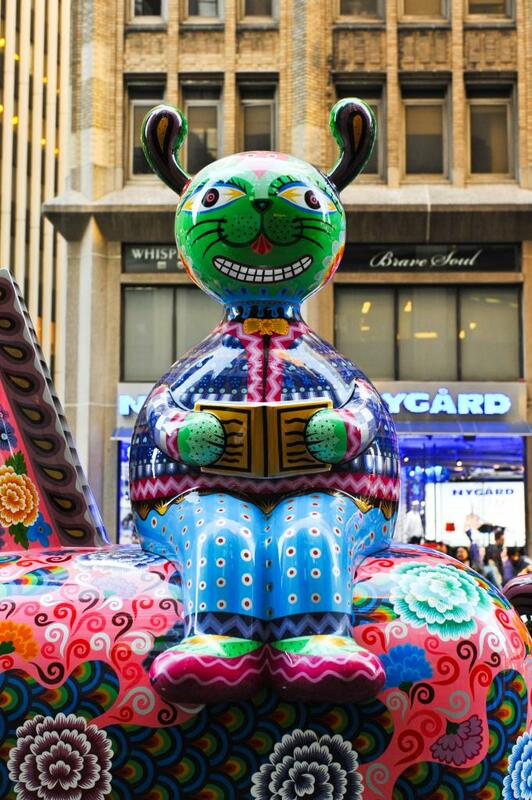 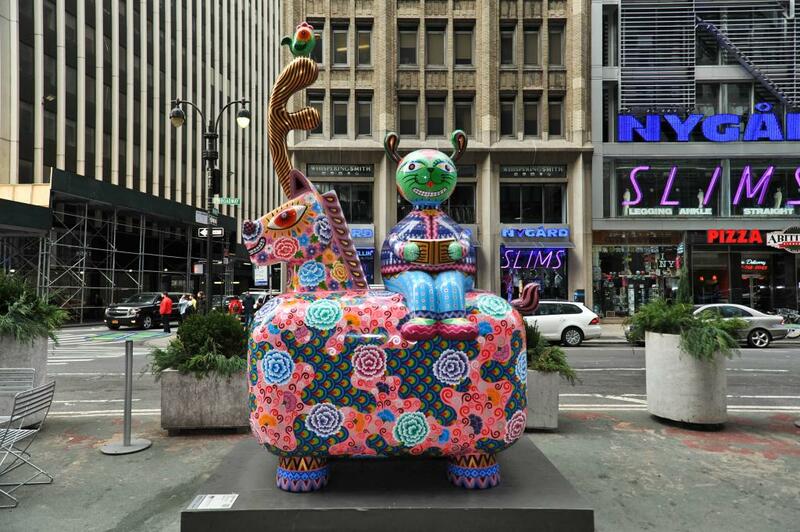 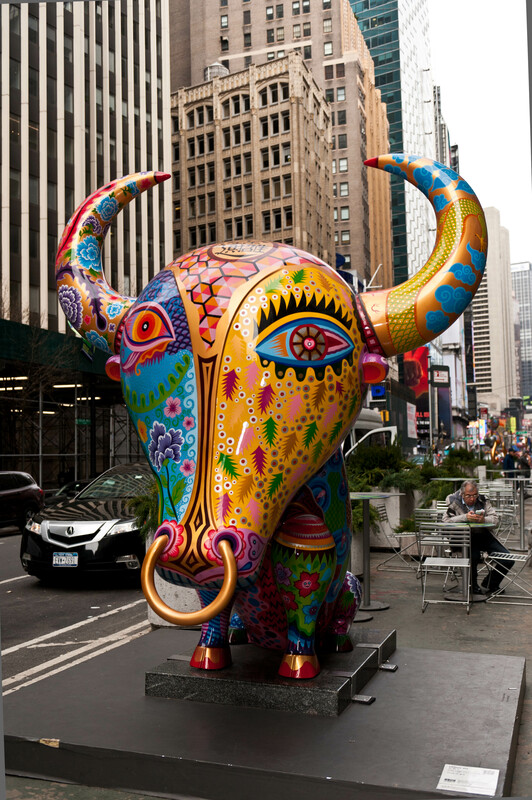 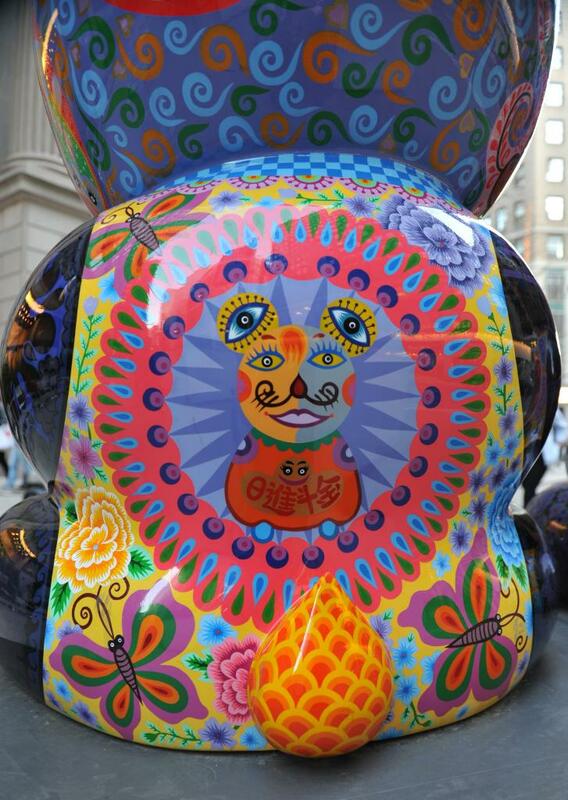 Yellow Ox, at 40th Street, is a joyous celebration that contrasts the famed downtown ode to capitalism, Charging Bull. 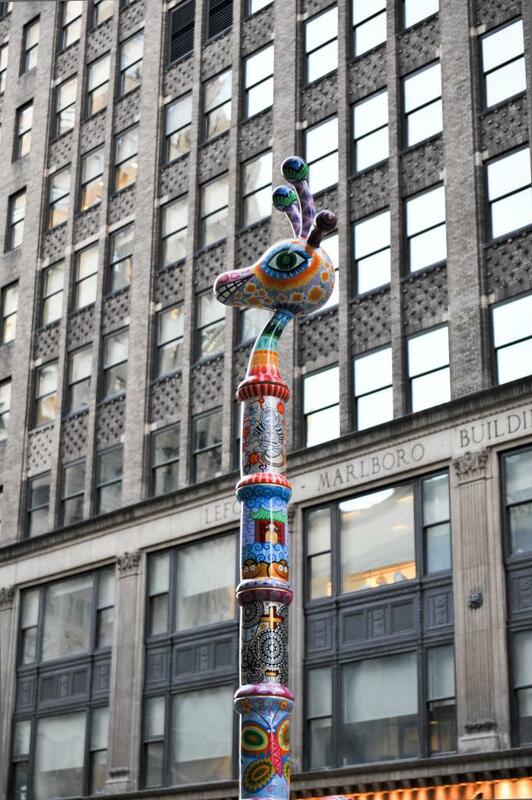 Giraffe Fortune towers above most everything on Broadway. 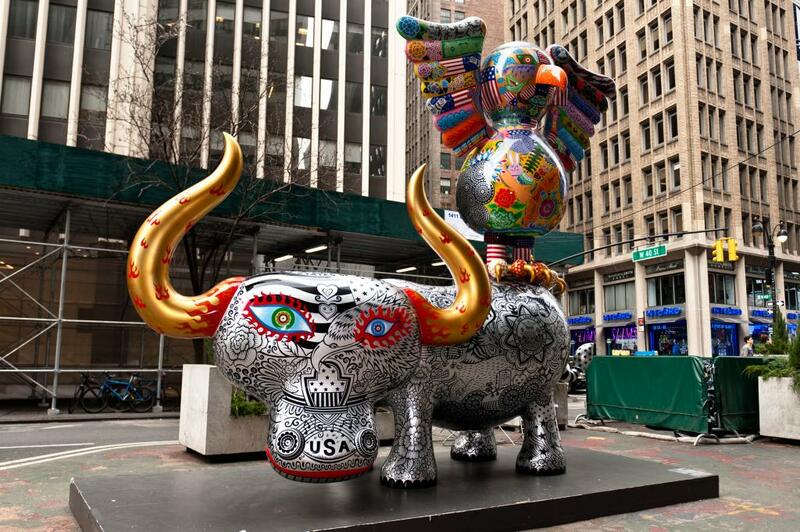 Buffalo and Eagle, comprising of a symbol of the United States perched upon a symbol Native American culture, intertwines and clashes American and modern imagery (the American flag, Mount Rushmore, mechanical gears, etc.) 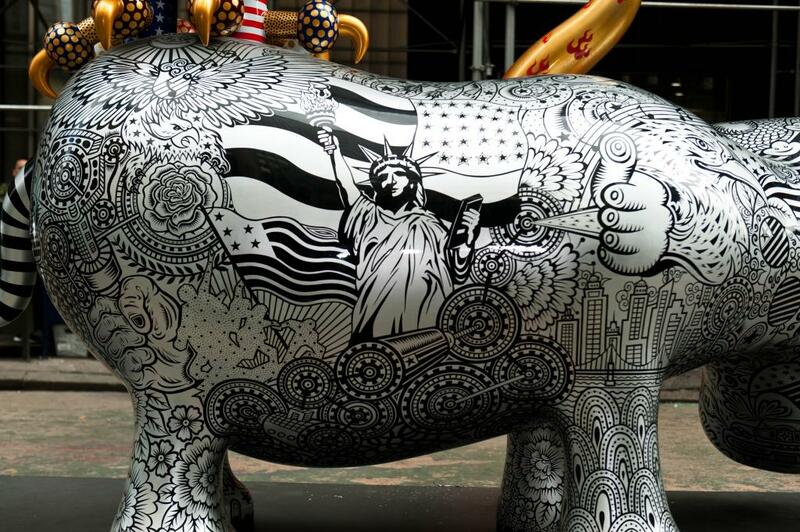 with the designs seen on the other sculptures. 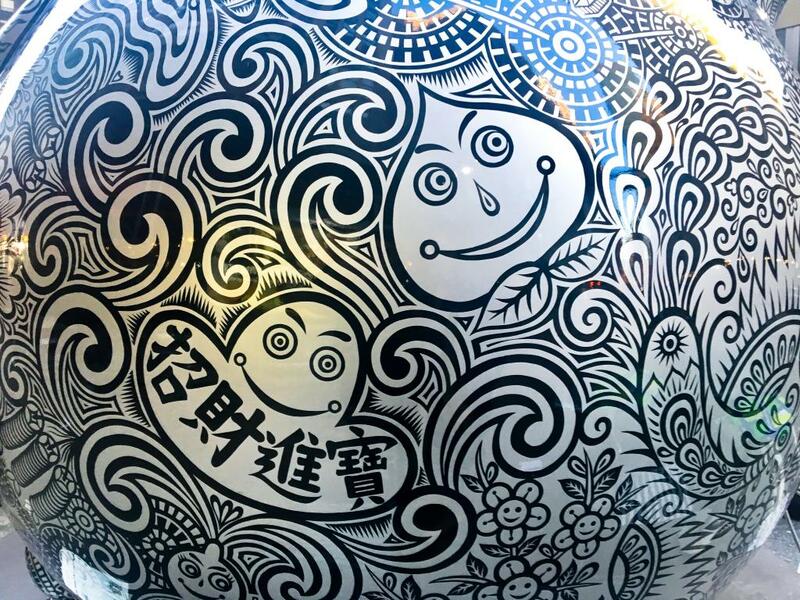 Though many parts of the designs and symbols will look familiar, this public art project isn’t about pondering their meaning within any context. 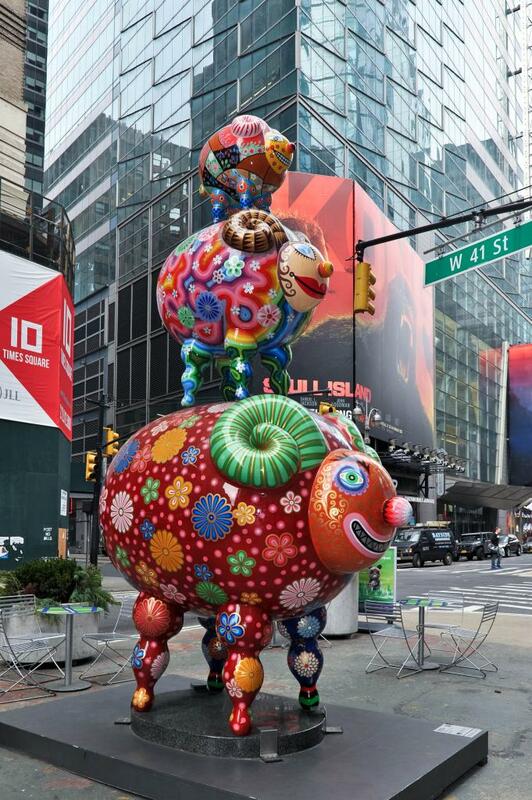 Hung Yi’s carnival just brings to town and our daily lives the delight of visual spectacle and imagination. 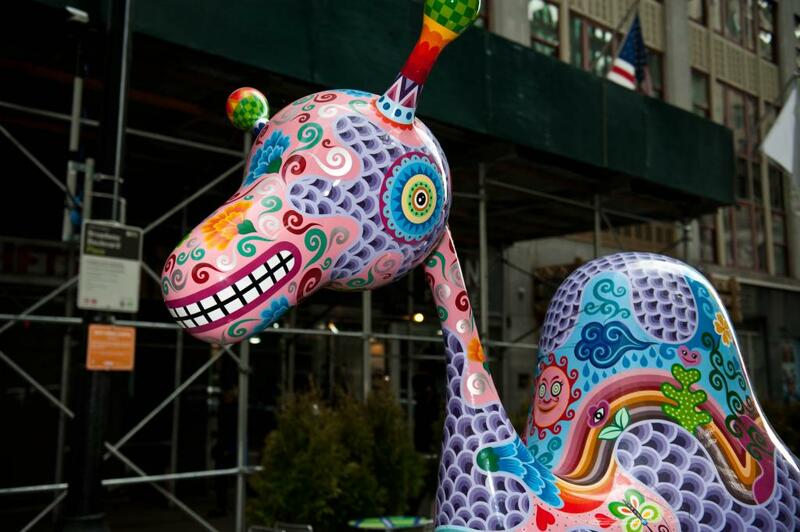 Fancy Animal Carnival is on view on Broadway between 37th and 41st Streets through April 15, after which time it travels to Washington, D.C. 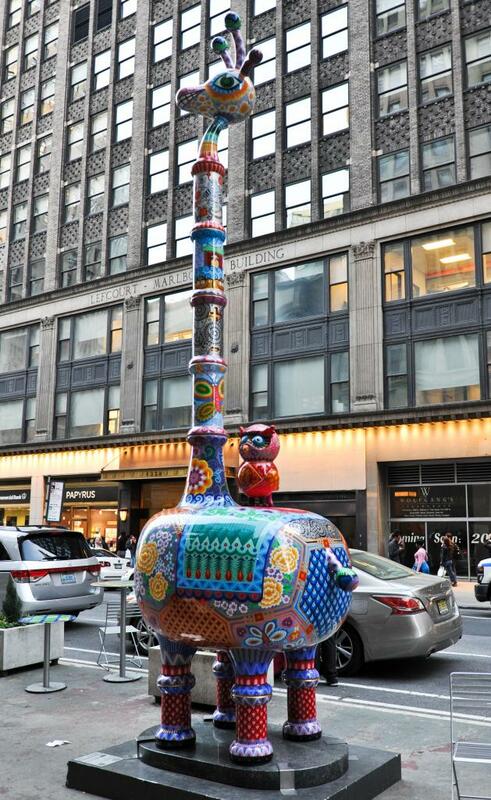 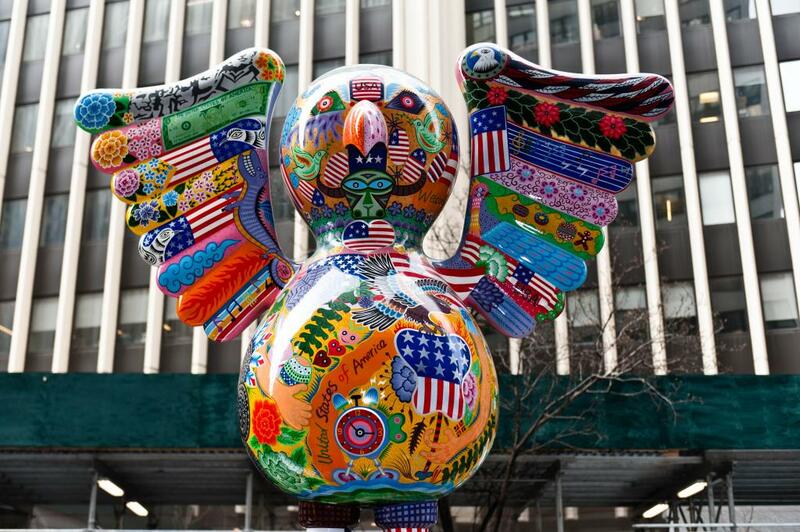 The project was brought to New York by InSian Gallery and Emmanuel Fremin Gallery in partnership with the Garment District Alliance.